Youth of all ages, but especially younger children, may find it difficult to recognize and verbalize when they are experiencing stress. For children, stress can manifest itself through changes in behavior. Common changes can include acting irritable or moody, withdrawing from activities that used to give them pleasure, routinely expressing worries, complaining more than usual about school, crying, displaying surprising fearful reactions, clinging to a parent or teacher, sleeping too much or too little, or eating too much or too little. With teens, while spending more time with and confiding in peers is a normal part of growing up, significantly avoiding parents, abandoning long-time friendships for a new set of peers or expressing excessive hostility toward family members, may indicate that the teen is experiencing significant stress. While negative behavior is not always linked to excessive stress, negative changes in behavior are almost always a clear indication that something is wrong. Adults will want to pay attention to these behaviors and determine an appropriate response or intervention. Parents, children and teens do not need to tackle overwhelming stress on their own. 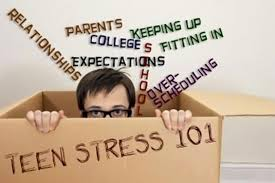 If a parent is concerned that his or her child or teen is experiencing significant symptoms of stress on a regular basis, including, but not limited to those described above, it can be helpful to work with a licensed mental health professional, such as a psychologist. Psychologists have special training to help people identify problems and develop effective strategies to resolve overwhelming feelings of stress.